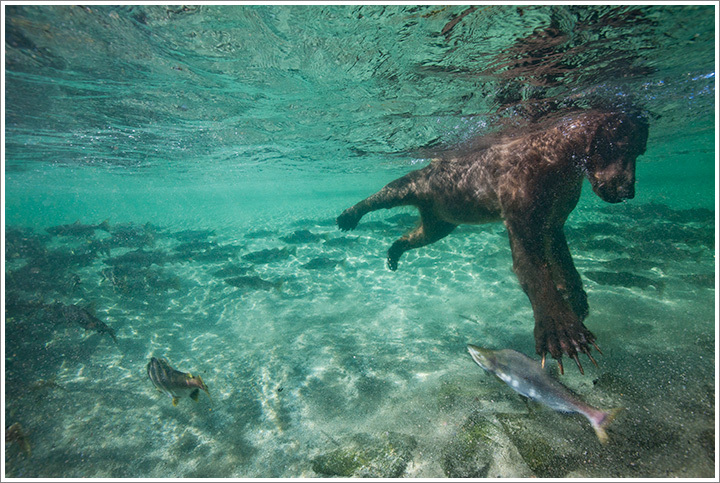 Underwater view of Grizzly Bear (Ursus arctos) swimming after spawning salmon in Katmai National Park on summer day. Photographed August 23, 2010 with Canon 1Ds III and 16-35mm f/2.8 Lens using an underwater housing and remote release. Runner-up: Underwater World at 2011 BBC Veilia Environnement Wildlife Photographer of the Year Competition. This entry was posted on Tuesday, November 8th, 2011 at 5:50 pm. It is filed under Underwater and tagged with Alaska, BBC Awards, Bears, Grizzy Bear, North America, Underwater, USA. You can follow any responses to this entry through the RSS 2.0 feed.